Loon Lake - Lake Rights! Falls Lake is located near the center of North Carolina and borders the eastern edge of a region of rolling hills known as the Piedmont Plateau. The main body of the lake is in Wake and Durham counties, but some of the upper reaches extend into Granville County. Although some portions of the project area remain rural in character, the rapidly expanding urban and suburban growth areas of Raleigh surround project lands on the lower third of the project as do outlying neighborhoods of Durham to a lesser degree in the western part. Falls Lake is a man-made reservoir located in the upper portion of North Carolina's Neuse River Basin. The dam is located a few miles north of Raleigh, at the village of Falls. The lake extends 22 miles upstream from the dam to the confluence of the Eno and Flat Rivers near Durham, containing 12,000 surface acres of water and 230 miles of shoreline. The reservoir is open for public recreational use. The North Carolina Division of Parks and Recreation manages developed recreation areas on Falls Lake as a part of the North Carolina State Parks system. Identified as the Falls Lake State Recreation Area, this collection of swim beaches, campgrounds, picnic areas, hiking trails, boat ramps and fishing piers offers exciting opportunities to enjoy the outdoors. Anglers will also find plenty of opportunities at Falls Lake. Artificial structures that attract and concentrate fish are submerged near shore and marked with buoys. Fish stocking efforts are conducted to supplement naturally occurring populations. Fishing is permitted throughout the reservoir with the exception of a restricted area near the dam. Highway 50 Boat Launch is a day-use facility consisting of a boat launch, 1 comfort station, as well as numerous fishing spots and picnic tables. Picnic tables are on a first-come, first-serve basis. 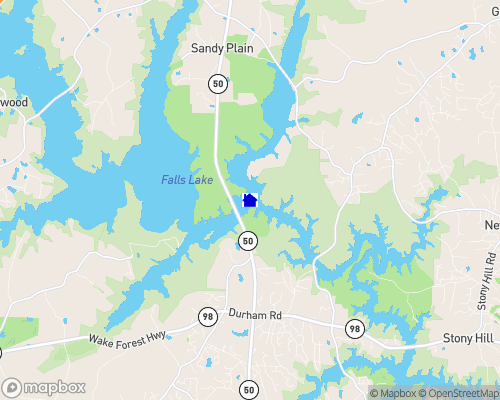 Rollingview Marina, 919-596-2194, 3940 Falls Lake Rd, Durham, NC 27703-8866 Rolling View is a family campground consisting of 117 electric and non-electric campsites, 4 group campsites, 3 wash houses, 3 comfort stations, a swimming area, 2 fishing piers, boat beach, boat launch facility, 5 picnic shelters, numerous picnic pads, and a community building. All campsites are on a first-come, first-serve basis. To claim a campsite, you MUST set up a camping unit, such as a tent, camper, or R/V. Coolers, lawn chairs, etc. will not be accepted as claim to a campsite. Visitors and campground guests staying for the day are required to pay the $4 entrance fee. Rolling View Recreation Area also offers group camping. There are 4 group campsites, which are open by reservation only. Each group campsite holds 5-25 people, has a fire pit, grills, and picnic tables. Sandling Beach is a day-use facility consisting of a large swim beach, 3 comfort stations, boat beach, and picnic shelters. Picnic shelters are first-come, first-serve basis, or you can reserve them for the day, by contacting the Park Office. Sandling Beach also offers a self guided nature trail, located across from Picnic Shelter #1, as well as numerous fishing areas. Beaverdam is a day-use facility consisting of a large swim beach, 4 comfort stations, boat launch, 2 fishing piers, and picnic shelters. Picnic shelters are available on a first-come, first-serve basis, or you can reserve them for the day, by contacting the Park Office. NO gas powered boats are allowed on Beaverdam Lake. Only canoes, kayaks, electric trolling boats, or other non-gasoline powered boat are admitted. B. W. Wells is reserved for group camping only, and is only open by reservation. There are 14 group campsites, all equipped with picnic tables, 3 large grills, benches, water spigot, and a fire pit. Campsites are for groups of 5-35 people. There is a loop trail (1.3 miles), a boat ramp (for camper's use only), and 2 wash houses, each with hot running water. Recycling centers are conveniently located at the wash houses for cans, glass, and plastic containers. Reservations for group sites can be made at any time. All campsites at B. W. Wells are pack in/pack out sites. NO vehicles will be permitted out of the designated parking areas. If you have an excessive amount of camping gear, we would suggest you bring a hand truck or wheelbarrow or cart of some type. This would be especially applicable if you have a site that is a great distance from the parking areas. A ranger will check you in at the campsite prior to closing the gate. At that point, the ranger will provide you with instructions to follow in the event of an emergency. If you have access to a cell phone, we encourage you to bring it with you, as there are no phones in the park. For your groups safety, we do not permit swimming, firearms or alcoholic beverages. Fires can be in designated fire rings and grills only. Hunting is NOT permitted in the park, but with adjoining game lands, we suggest that people hiking in the woods wear brightly colored clothing during hunting season. Holly Point is designed for camper's use only. There is no day use in this campground. Holly Point is a family campground consisting of 162 electric and non-electric campsites, 5 wash houses, 2 swim beaches, and a boat launch facility. Handicapped sites are available on sites 19, 51, 91, 132, and 137. All campsites are on a first-come, first-serve basis. To claim a campsite, you MUST set up a camping unit, such as a tent, camper, or R/V. Coolers, lawn chairs, etc. will not be accepted as claim to a campsite. If you would like to reserve a campsite, you will need to do so at least 2 weeks in advance, and for a minimum stay of 7 nights. Holly Point is the only campground at Falls Lake that has lake front campsites. Most of these do not have electric and water hook-ups. Campers using these sites are allowed to pull their boat to the site, but at the sole risk of the owner. The Division of Parks and Recreation, Falls Lake State Recreation Area or any of its staff will not be held liable for any damage of theft of items that may occur. Campground Features - Large Campsites, 20/30 amp GFI Service, Hot Showers, Centralized Dumping Station, Playgrounds, Swim Beaches, Boat Ramp, Fishing Access, 2 week Max. stay / 30 day period, Interpretive programs. Shinleaf State Recreation Area is a primitive hike-in campground consisting of 89 non-electric campsites, 1 wash house, and 5 mulch toilets. If you have an excessive amount of gear, we suggest you bring a wheelbarrow or cart of some type. This would be especially applicable if you have a site that is a great distance from the parking area. Campsites 1-42 are closed to the public due to low attendance. All campsites are on a first-come, first-serve basis. To claim a campsite, you MUST set up a tent on the site. Coolers, lawn chairs, etc. will not be accepted as claim to a campsite. Shinleaf Recreation Area has a Self-Registration Center, located at the wash house at the end of the parking lot. Just fill out the envelope and put it in the registration box. A park ranger will check you in at the campsite prior to closing the gate. At that point, the park ranger will provide you with instructions to follow in the event of an emergency, as well as reimburse you if you do not have exact change. If you have access to a cell phone, we encourage you to bring it with you, as there are no phones in the park. For your safety, we do not permit swimming, firearms or alcoholic beverages. Fires are allowed in designated fire rings and grills only. Hunting is NOT permitted in the park, but with adjoining game lands, we suggest that people hiking in the woods wear brightly colored clothing during hunting season. Shinleaf is designed for camper's use only...there is no day use in this campground. In addition to the federal and state agencies present at Falls Lake, the Wake County Parks system operates Blue Jay Point County Park. This park places an emphasis on providing environmental education in a natural setting for school children and group leaders, and encourages visitors to enjoy hiking trails, playground and picnic areas.